Buy. Download. Create. Get Photoshop now at the Adobe Store. Get Flash, Dreamweaver, Photoshop Extended with Adobe Web Premium. 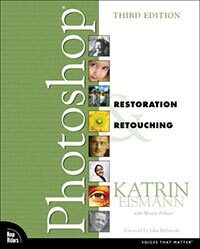 Interview With Katrin Eismann - On The Release Of "Photoshop Restoration & Retouching, 3rd Edition"
Katrin Eismann is a lecturer and teacher on the subject of imaging, restoration, and retouching, and was inducted this year into the Photoshop Hall of Fame. She was also on the Photoshop CS alpha and beta team, and is one of a very few non-Adobe employees thanked on the official splash screen. Her books include Photoshop Masking & Compositing and Real World Digital Photography, as well as the recently released third update of Photoshop Restoration & Retouching. A long time favorite of the photo restoration crowd, Photoshop Restoration & Retouching, 3rd edition, is filled with even more valuable retouching information and incorporates some of the new features found in CS2. This is a beautifully designed book that is a pleasure to browse through and easy to work with. The lessons are very straightforward and the tips and techniques that are shared can bring you some truly extraordinary results. 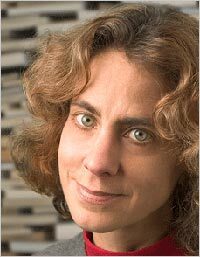 What level of expertise is needed to follow your book? Curiosity, passion, and a working knowledge of the tools and palettes of Photoshop 7, CS, or CS2. Working knowledge is knowing what the Photoshop tools do, what the palettes represent, and how to manage files. Did you include new material for this third edition, or is mostly an update on previous editions? 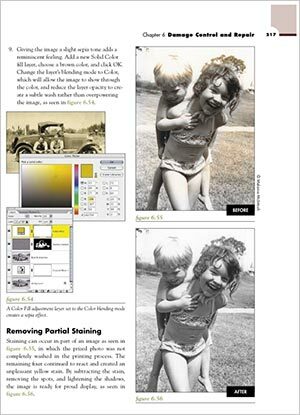 "I just received my copy of the Third Edition Restoration and Retouching from Amazon. I have devoured your first two editions. I have been bouncing back and forth reading sections, especially the portrait and glamour chapters. Thank you and congratulations on a very good and important book in restoration and retouching. It appears to be an entirely new book and not just a re-hash of previous editions. That is nice. I personally appreciate your efforts as will many others." "I just purchased your new 3rd edition of Restoration and Retouching to go with the 1st and 2nd editions on my bookshelf. It appears to be a nearly complete re-write so should keep my interest in working through it yet again." For someone new to this field, how would you describe the learning curve for being able to perform some basic repairs and retouching? Basic corrections such as cropping, improving tone with Levels, and repairing scratches with the Spot Healing brush isn't that difficult to do well. In fact, many times doing these three steps can make older, faded images pop back to life very quickly. Do you think that the biggest mistake absolute beginners make is overdoing the retouching process? I feel that the biggest mistake beginners make is being overly ambitious, as they scan in the entire shoebox of images in the hope of fixing them all. It is very important to prioritize your time and effort by sorting the images into categories of importance and damage. Start with the most important images with the least amount of damage and as you learn the more challenging ones will be easier to repair. What's the most important piece of advice you have for someone new to this? Find a project that excites you and go for it! What improvements or new features in CS2 will benefit the photo retoucher the most? There are quite a few including - Lens Correction, Smart Sharpen, Vanishing Point, Surface Blur and of course the Spot Healing brush. What is your favorite new feature in CS2? SMART OBJECTS...sorry for the yelling! The flexibility that Smart Objects entails offers a brand-new way of thinking about and working with images. Every Photoshop expert has that one signature trick that they use over and over again. What is yours? Well there are really two... first of all I always see if blending modes can do the work for me and secondly I love experimenting with the 'Blend if' sliders when compositing images to see how the layers interact to create surprising results. Please tell us about your current and future projects, and other publications you might have in the works. I just released a DVD with Software Cinema with 8 hours of materials on Image Restoration. In January I'll start working on a new book that addresses advanced digital darkroom techniques; continue teaching classes at the School of Visual Arts in both the graduate and undergraduate programs; and continue working on a photographic series about the NJ Meadowlands. Thanks Katrin, and we wish you continued success in your endeavors. Visit the companion website for the book. Read the full Press Release for the book. Find out more about Katrin at KatrinEismann.com. Buy Photoshop Restoration & Retouching at Amazom.com for $29.99 - 34% discount. Photoshop Elements guru Matt Kloskowski has created a new 21-day online course, Organizing and Sharing Your Photos with Photoshop Elements. These lessons will show you everything about keeping your photos in order and the best ways to share them with other people. You'll even learn how to back up your photos and keep them safe in case you ever need to reload them. Photoshop Elements Techniques newsletter now offers a "GIFT" Subscription option for holiday shopping. This is a great present for anyone who uses Photoshop Elements. Packed with illuminating tutorials from leading instructors, each issue offers secrets of this amazing program and teaches how easy it is to do everything from color correcting and sharpening photos, to creating the most requested photographic special effects and how to turn all of this into creative new projects. Today through December 31, 2005 get Six Images from iStockphoto.com plus the new Photoshop Elements 4 Bonus Issue free with all new subscriptions.